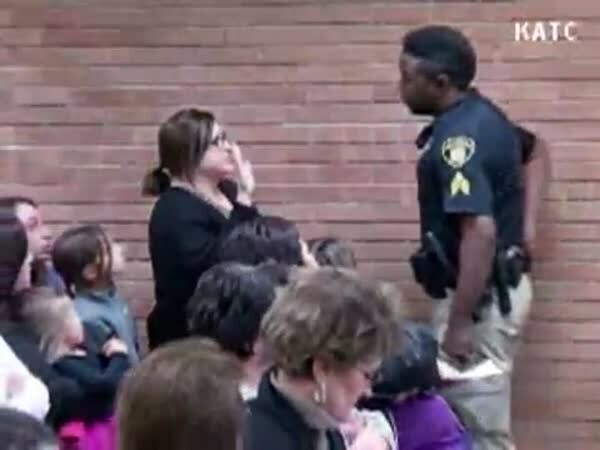 Deyshia Hargrave, an English language arts teacher at Rene Rost Middle Schools in Kaplan, confronted Vermilion Parish school board members during the public comments section of the meeting and was escorted out the second time she approached the podium – resulting in a scuffle in the hallway. After Hargrave posed several questions, board president Anthony Fontana ruled Hargrave out of order, warning her that the public comment section was not for a question-and-answer session. Hargrave was called upon a second time for comment. After posing another question, an Abbeville city marshal on duty at the meeting grabbed Hargrave and removed her from the meeting. If there was any sort of justice here, these school board members would all resign over this. I’m sick of seeing fascist tactics employed at these meetings and nothing ever done about it. It is a violation of your constitutional rights to be treated like this. And shame on people for not standing up for this woman. They made her opinion a crime. The board voted 5 to 3 in favor of increasing the school superintendent’s salary $38,000 more per year. In 2016, there were calls for Jerome Puyaus’ termination after threats of intimidation were made against teachers and principals. All of that is outrageous. Anthony “Tony” Fontana Jr. is up for re-election in 2018. He ran unopposed in 2014. It’s unclear if the marshal received orders from board members, or if he was acting on his own. But my money is on the board members. The superintendent of Vermillion Parish schools said that the school board will not press charges against Hargrave. How big of them. The Vermillion Parish schools referred questions to Fontana, who did not respond. The Abbeville Marshals Office has not returned phone calls seeking comment either. Deyshia is the one who should sue here and if I were her, I’d make it my life’s work to go after that school board and superintendent.